A day of invaluable information AND the launch of PWTAG’s new spa book. Hot tubs for Business – Publication Launch – free copy for every delegate! 9:50 Background numbers of Cryptosporidium in Pools, advice to the Operator. 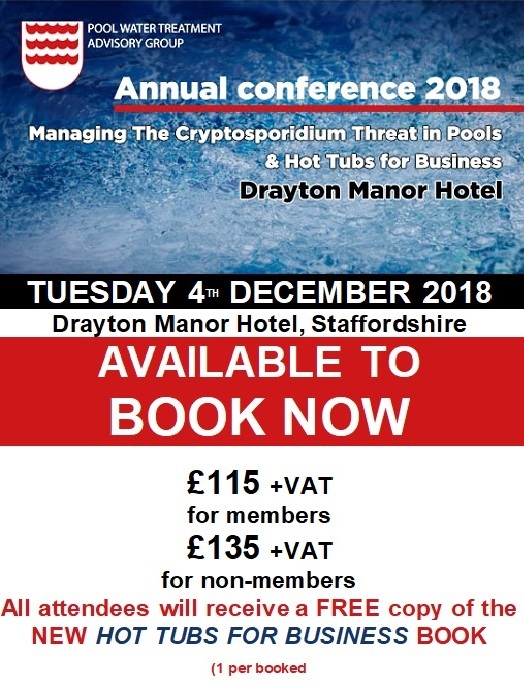 Professor Chalmers will provide delegates with an insight into the findings of our UK study of the background numbers of cryptosporidium in pool water and its implications for the operator. Results from a range of examples of sand filters in action in commercial pools will be discussed, highlighting the wide range of filter performance. The talk will introduce ideas on how information on circulation and filtration can be combined to provide valuable performance indicators that have, up until now, been just theoretical rather than practical tools. This paper considers filtration from past to present and the advances now being made with new techniques, which could revolutionise the way we think about filtration systems in the UK. From drownings to diarrhoea, and Legionnaires’ disease, Angie will provide us with an overview of the impact on consumers and the travel industry of not designing, operating and managing pools properly and the measures needed to prevent them? With examples from her vast experience of dealing with problems in the travel industry, this will make an excellent paper. Domestic-style hot tubs – perhaps badly chosen or installed, poorly maintained or wrongly used – can be lethal when they’re used for business purposes. There have been a number of outbreaks, including fatalities, linked to hot tubs in holiday park rental units, hotel bedrooms, holiday lets, on hire and even on display. The hot tub market has grown exponentially in recent years. No holiday destination or hotel is today complete without one. Purpose built or off the supermarket shelf getting the basics right is fundamental to their success. Janice will lead you through the whys and wherefores in the business of hot tubs and explain the training requirements. The new book draws on the guidance in HSG282 but supplemented by the expertise represented on PWTAG – and presented in the clear and definitive fashion that the many thousands of readers of PWTAG’s Swimming Pool Water have appreciated over the years. Anyone operating, or contemplating installing, hot tubs as part of a business activity will need to hear this paper in conjunction with reading the book if they want to be both safe and up to date with the latest guidance. Getting it right and avoiding infectious outbreaks is a must for the hot tub business operator. The session will guide you through the operational essentials to minimize the risk of infections and the threat of prosecution. Center Parcs operates and maintains significant numbers of hot tubs within their parks. In their business there is no room for mistakes or coming second best. Ruth Hollins the Health and Safety Manager for Center Parcs will describe how they have structured this growth area of their operation and how they manage hot tub health and safety for success and guest satisfaction.